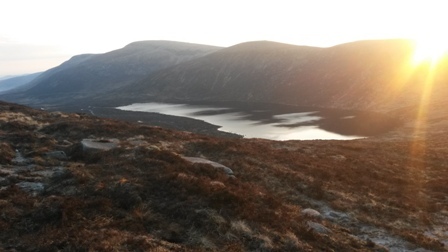 On Easter Monday I decided to head to Doan in the Mournes for my first bivvy. 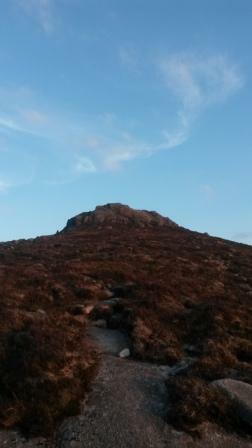 It was also my first solo bivvy and first summit bivvy to boot, so was feeling pretty aprehensive about the whole idea. I kept worrying about all the things that could go wrong , in particular what I would happen if I got to the top and there was already someone else camped there? I tried not to worry too much and hit the road. I parked at The Ott Carpark and made my way along the track. I had remember reading to turn right at the fork (what fork?) but i missed it and ended up traipsing through the boggy ground below. Caked in mud and with drenched feet, I was very relieved when I finally made it to the Mourne wall and set eyes on Doan. I had never been there before and was very keen to get to the summit before sunset. I hopped over the wall and made a bee line for the moutain, again tramping through the muddy bog. My “waterproof” trainers were pretty useless and I cursed myself that I hadn’t packed some spare socks. When I eventually reached the path to the summit it was pretty straight forward and when I arrived at the top I was thankfully all alone. I took in the awesome views and tried to find the best place to set up camp. I decided on a nice wee spot just facing Ben Crom and unpacked my gear. I was looking forward heating up some super noodles on my Trangia, but unfortunatley my fuel had leaked all over my bag. I would have to make do with my flask of coffee and a Snickers. I took in the beautiful sunset and was amazed at how remote and silent it felt. I really have never experienced anything like it. I spent most of the evening reading and watching the stars. I thought it would be pretty terrifying when the sun went down but I never once felt scared or threatened and actually found the whole experience very calming. I think being in the bivvy made me feel a bit more aware of what was going on around me. In a tent your mind can play tricks on you a bit when you hear the odd noise. I Drifted off and woke at around 3am absolultley baltic. 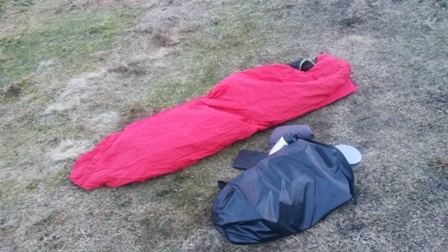 I thought by sleeping in my down jacket, my (ahem) Halfords Urban Esacpe Ultra Light sleeping bag would do the job. It didnt. I had no more clothes to put on, so I had remembered reading once that ‘you warm the bag’, so I tried to do as many sit-ups as possible to generate a bit of heat. It did help and I eventually nodded off and slept right through until 6. Waking up in a bivvy is also something I loved. Sitting up and looking round to take in your surroundings is just the best way to wake up. I thought about the breakfast of Aeropress coffee and porridge I could have been having had my fuel not leaked, and packed up my gear. I returned to the Ott car park the correct way this time and even spotted the fork I had missed the night before. When I got home my wife told me that I looked like I had been “on the razz and slept in a shop door way”. It wasn’t really the look I was going for but It was completely worth it . With thanks to Neilers. Original thread here. Thanks for your account & good to hear it’s ok to leave the car in the Ott track car park overnight…I’m never sure about car parks in the Mournes…Doan sounds like a sweet summit bivvy!